A bunion is a painful bump that appears on the side of the big toe, and is caused by a misalignment of the neighboring joint. The condition is usually hereditary, but can be exaggerated or irritated by tight shoes or overuse. Bunions can be removed with a bunionectomy, which realigns the joint to reduce the risk of the bunion returning. One important point – ensure the procedure is performed with the most advanced surgical techniques, as are employed by our team at Heiden Orthopedics. Bunions occur where the big toe, or the hallux, joins with the first bone in the foot, called the metatarsal. This joint is also known as a metatarsophalangeal (MTP) joint. 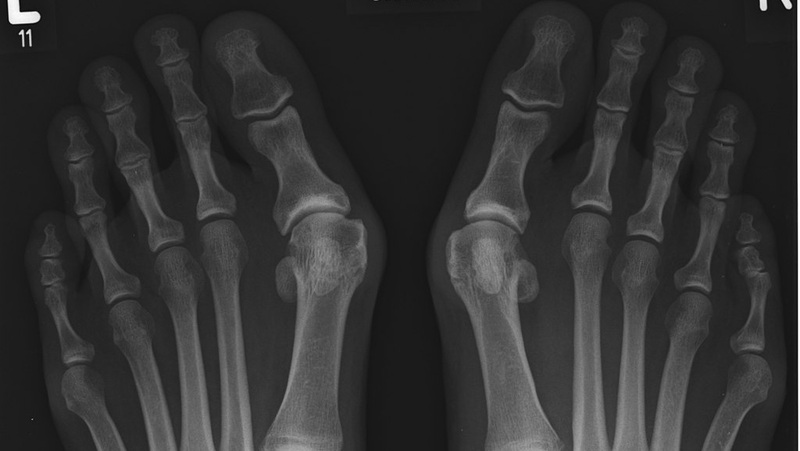 There are several abnormalities that can cause the big toe to start to migrate toward the second toe. As the big toe is being pulled, the head of the metatarsal bone begins to stick out, resulting in a visible (and painful) protrusion on the side of the foot. The tendons and ligaments around the joint can either tighten or become stretched, resulting in inflammation and pain. The bursa, or sac around the joint, can also swell and make the bunion even larger and more painful. There are several different techniques for a bunionectomy, and during your consultation we will evaluate what procedure will be most effective in your individual case. The procedure is typically performed on an outpatient basis, and you will be able to return home the same day. During the procedure you may under general or local anesthesia. Under general anesthesia, you sleep through the procedure, but local anesthesia with IV sedation will significantly relax you and make the procedure comfortable. During the procedure, your surgeon will access the MTP joint through an incision made on top of the big toe or on the side of the foot. The bump will be removed, but can return if the foot is not corrected. The joint can be realigned by removing a small wedge-shaped piece of the metatarsal bone, held in position with screws, pins, or plates. Tendons around the bunion may need to be trimmed or repositioned to properly fit around the joint. Any damage in the joint from a previous bunion surgery will also be removed. Once completed, the incisions are closed and your foot is bandaged. Some swelling or pain may occur directly after your procedure, but you can reduce the swelling by keeping your foot elevated for the first few days. You may need to use crutches or a surgical boot s to keep weight off your foot and provide support for faster healing. Your surgeon will likely recommend foot and toe exercises to prevent the area from getting stiff, and will let you know when you can resume your usual activities. A bunionectomy can realign the joint, decrease pain, and improve the appearance of your foot for the long term, although genetic factors may cause it to return. Let Heiden Orthopedics assist you with a bunionectomy, and any foot joint health issues. I had a nunionevtomy a year ago, and the screw is starting to protrud e, as seen in x-ray. Can this screw also be what is causing pain in the ball of my foot, as well as in my toes? Pain can be due to many factors. With the information provided, I would say yes. Most of the time, removing the screw will take care of the pain. Feel free to come see Dr. Dickerson. I have flat feel. Over time as the feet became flattened to this point a bunion has formed on both feet which makes the wearing of most shoes painful. If there a way to resolve this byarch supports instead of surgery. I’m 76 but since my father will be 102 in March I could be living for awhile. Arch supports can help but will not correct the bunion deformity.